We've been spending the whole day with our smartphones at hand and with round-the-clock access to the Internet. So it's not surprising that we prefer to communicate with friends through all sorts of instant messaging apps. And the most popular among them is WhatsApp. According to Statista, every month WhatsApp is being used by 1 billion people around the world. In addition, it’s the most sought-after application in 109 countries. But what is the purpose of Whatsapp (in global terms)? Why is it so successful? And, most importantly, how to create a messaging app like WhatsApp? There are so many questions, and each of them requires a detailed answer. Fortunately, we have the right information, and we’re ready to share it with you! WhatsApp: what is it? Why and when do we need it? In fact, WhatsApp is a mobile application helping people in exchanging short messages online. And it's not just the most successful project, it's a typical image of the American Dream come true. This is the legend of an immigrant from a poor family who managed to become a billionaire and blessed our mankind with a new useful service. No wonder we want to learn how to develop an app like Whatsapp! The essence of the application is reflected in its name which is literally offering us to contact our families or friends to find out how they feel. "What's Up, guys? Can I help you?" 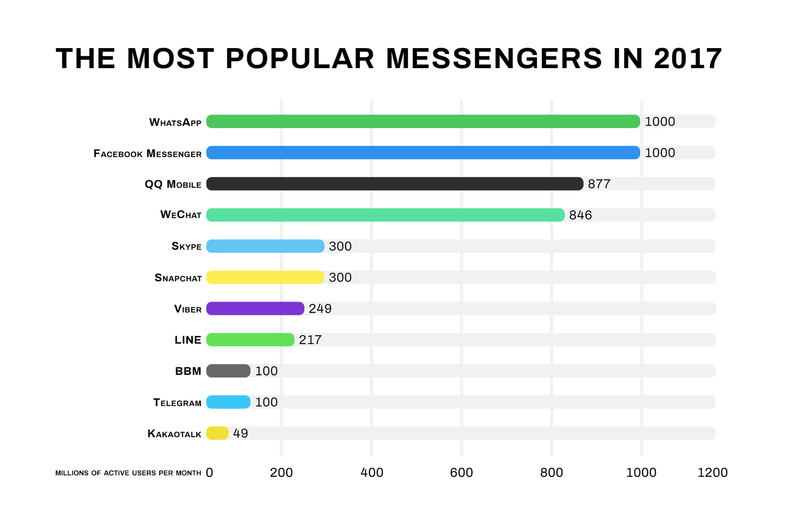 WhatsApp is especially popular outside the US and successfully competes with Asian messengers. In addition, the program is in great demand in the emerging markets of Brazil, Mexico, and Turkey. 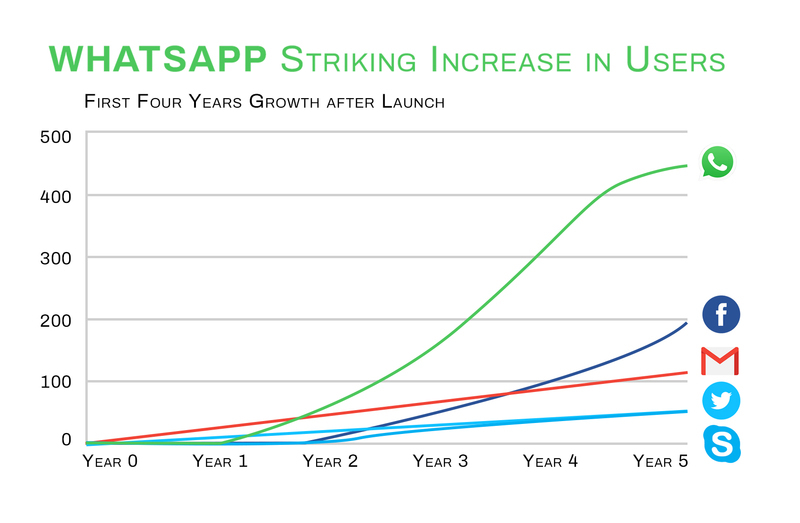 Since its launch in 2009, WhatsApp has evolved into the industry leader, available on almost all mobile OS. If you want to know how to make an instant messaging app like WhatsApp, you need to consider this competitor in more detail. What is it that attracts users? Also, WhatsApp allows you to download files from third-party cloud services, such as Google Drive, OneDrive and iCloud. Of courses, we’ve made a very brief overview, later in our article, we’ll give you much more information on the matter so that you’ll know in detail how to build an app like Whatsapp. And right now we're going to analyze WhatsApp marketing strategy. The questions like "What is a WhatsApp messaging service and how to use it?" aren't the key ones. It's much more interesting to figure out the way which helped the app to achieve such amazing success! What is its secret? Let's analyze WhatsApp history and strategy to see if we can adopt some of its ideas and tactics to build WhatsApp clone of our own. WhatsApp Inc was established on February 24, 2009, in California. Its creators are Jan Koum and Brian Acton. It may be said without exaggeration that this was a history of deafening success, and many consider it to be almost a miracle. And really, there are a lot of questions to be asked. How did the application manage to sweep the market and win about 450 million users around the world? What had been done in order to distance rivals, and the strong ones? And how did Koum, a native of Ukraine, manage to create a messenger app which Facebook had bought (and paid about $ 19 billion)? When Jan Koum came up with the idea of the service of the sort, the constant online Internet audience numbered billions of users. In such circumstances, the task to embrace the audience of several hundred million turned out to be an attainable goal. Let’s just say, when AOL was being launched, only 3% of users were constantly online. So the growth of the number of phones connected to the Network greatly helped plans of WhatsApp's owners. Taking advantage of the existing infrastructure, the company was able to fully tap into its resources and develop a chat app offering real-time interaction, with the best user experience. Not everyone knows that WhatsApp wasn’t always an instant messaging app. Initially, Jan Koum designed it as an iPhone application whose task was to show the status of users in the contact list. The need to create such a “status service” became apparent to Jan Koum after one incident which occurred in his own life. He was doing fitness in the gym when his angry boss from Yahoo! company called to find out why he wasn’t at the office. And this was a moment when Jan realized the usefulness of having a phone service with statuses showing the level of contact availability. Soon, Apple launched a push notification system, and Koum took advantage of the innovation by integrating it into WhatsApp. In the new version of the application, the program began to notify users of any change in the status of their contacts. Users liked the feature so much that they started sending notifications (namely, messages of sorts) to each other. Koum was amused to find out he had managed to create a messenger app though he didn’t mean to. Reflecting the prevailing mood of users, Koum had released WhatsApp 2.0 which had a lot more instant messaging app’s features. Thanks to this forethought, the number of users had reached 250 thousand people at a fast clip. There is no doubt the WhatsApp growth was significantly affected by the fact that using the application was much cheaper than sending SMS and MMS messages. Since WhatsApp relied on 2G and 3G technologies, users were able to bypass the constant limitations of mobile operators and the high cost of services. In addition, WhatsApp offered features which mobile operators didn’t have: group chats, the ability to send audio and video files or share your location… Undoubtedly, such an extended functionality made such an instant messaging app even more tempting in the eyes of users. And one more tip… want to know how to make an app like WhatsApp? Take care of data security! The fact is that working with users’ personal messages is always a huge responsibility, and this is what the WhatsApp company had taken very seriously in the process of building a modern chat app. WhatsApp doesn’t collect your private information, such as name, gender, address or age. Registration is carried out using a phone number which eliminates the need to remember logins and passwords. And there is one more benefit: messages, after being delivered, are always deleted from WhatsApp servers. All these factors, undoubtedly, also contributed to the WhatsApp success. To create a messaging app like WhatsApp, you must understand that your powerful competitor has provided users with maximum comfort in the process of their communication. Do you know what this is about? Of course, about advertising! People hate advertising, but we all resign ourselves to its inevitability. That's why it's especially pleasant to get at one's disposal an instant messenger which not only satisfies the need for communication but also doesn’t irritate us with ads. In fact, WhatsApp creators expected such reaction when discussing how to build an instant messaging app which most of the users would be fond of. While being interviewed by Fast Companies, Koum explains that he considers smartphones to be a personal device which is unacceptable for advertising purposes. He says that when you receive a message from a beloved one, you want to answer immediately, not being distracted by advertising. As we’ve already explained, WhatsApp is not only managing without placing ads, the company itself doesn’t spend money either on advertising or on attracting users. Instead, the service founders focused on creating a useful product. Being intent on the improvement of their application, the creators have figured out how to make an instant messaging app of the highest quality. Of course, we, users, appreciate these efforts by joining the ranks of its admirers. Multi-platform support is another important point of the WhatsApp marketing strategy. Kum and Acton understood: the more users, the better. Therefore, they decided to create a messenger app which would cover not just smartphone users. So they needed to make their application cross-platform, accessible to a wide range of mobile devices including the oldest ones. Cross-platform scripting along with the support of mobile phones of outdated models allowed the service to reach a multi-million audience of users (even those who’re living in less-developed countries and therefore having only old smartphones). WhatsApp supports such devices as iPhone, BlackBerry, Nokia, as well as Android and Windows Phone. There is no doubt that WhatsApp application has an intuitive and user-friendly interface. And the obviousness of such a factor doesn’t reduce its worth. Therefore, a well-thought-out and consistent interface should be taken into account by everyone who wants to know how to build an instant messaging app of the top level. All of these factors have made WhatsApp a powerful and useful service. And then the word-of-mouth effect did the trick: every user, who appreciated the advantages of this instant messaging app, wanted to share his impressions with friends. It caused a viral effect which is still the main growth engine of WhatsApp. Gradually, the WhatsApp user base reached the limits when the network effect triggers, which led to an increase in the WhatsApp value. This is usually the case for large social networks, such as Facebook and Instagram. Agree, if a person downloads WhatsApp and finds out that 30 or 40 people from the list of his contacts have already been using the very same instant messenger, he’s unlikely to delete it. Moreover, there is a chance of him sending invitations to his friends as potential new users. So keep a network effect in mind if you want to create your own WhatsApp. 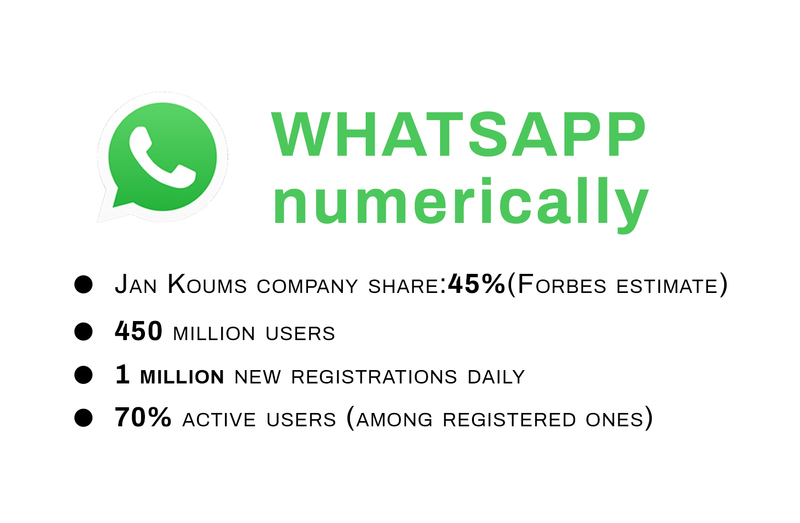 WhatsApp audience has quickly expanded to two and a half hundred thousand users. Subsequently, such a rapid growth made the instant messaging app one of the most popular on the planet. Discussing what a WhatsApp chat is and why it's in high demand, we cannot fail to mention the one-time-only deal, the deal of the century. The matter is that WhatsApp’s success attracted the interest of the high and mighty ones: every big mobile market player wanted to own such a wonderful service - probably, the best instant messaging app (or one of the best). By the way, Google offered a billion dollars to buy WhatsApp. But the winner was Facebook which was willing to part with gobs of money: 19 (!) billion dollars. So, February 19, 2014, was the day when Whatsapp became a part of the Facebook company. The bigtime deal had been concluded. Minimize annoying factors. You can hardly afford the luxury of giving up advertising, as WhatsApp did. However, try to avoid excessive importunity of ads. Investigate the application market. 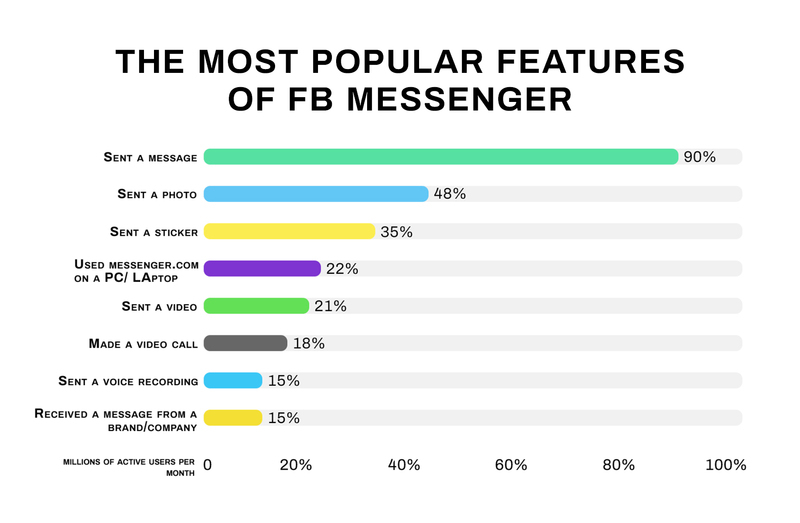 What other features have instant messengers left without attention? You can use their omission to satisfy users' requests to the fullest. Analyze user behavior. Keep an eye on the behavior of users in your application. Only because Jan Koum and Brian Acton had paid attention to the fact that users considered the notifications system as an instant messenger, they managed to develop an app like Whatsapp and achieve great success. Remember about security. Give close attention to this matter. Hire the most reliable developers who know how to build WhatsApp clone - that is, how to build a chat app which really protects users' interests. Use Network Effect. If a user has only two or three people on the contact list, the app of yours won’t be of great value to him. So, you need to attract as many users as possible. At the initial stages of promotion, you can, among other things, offer certain bonuses to those users who are ready to send out invitations to friends in order to ask them to join your instant messaging app. Initiate the effect of "word of mouth". Make people talk about your service, let them discuss it. To achieve a viral effect, you have to know how to create a super quality messenger app in Android and iOS, the app which not only fulfills the user's needs but also impresses people with its design, approach to the security problem, unusual functionality, etc. In addition, if you want to create your own WhatsApp, you should find out how this instant messenger interacts with the user, so you can copy the main idea. User Flow, or What is the Use of WhatsApp? What is Whatsapp and how does it work? These are the next questions on the list of important points which should be clarified to create a chat application like WhatsApp. Suppose you want to start using WhatsApp. What is the sequence of your actions? Give the program access to your contacts. Having accepted the terms of service (the inevitable step! ), enter your phone number in the specified text field and wait for the SMS message with the verification code. Enter the verification code which had been sent. And then you’ll be redirected to the profile creation page of the instant messaging app. Enter your name and upload the photo. It’ll help your contacts recognize you without any problem. If you’ve already installed WhatsApp, you’ll be offered the option to restore the chat history. It’s also possible to integrate personal data from your Facebook profile. As you can see, WhatsApp not only aims to simplify the registration process as much as possible, it makes the user's interaction with its system much safer. Bear it in mind while thinking of how to make an app like WhatsApp. Tap on the "New group" option to use multiple contacts to organize group communication. Tap on the person you need in the contacts to start communicating with him individually. a photo or video file from the smartphone Gallery. a document (a specific file which is stored on your phone or on the cloud service you are using - say, Google Drive). a map with your location. the contact information of the user from the list of your contacts. voice messages: you can create an audio recording and send it to a friend. What can you use to build your own user flow? Security of the highest level. We’ll discuss all these problems in more detail when describing how to make an instant messaging app. But first, let's pay attention to WhatsApp's competitors because they are yours either. If you’re planning to create your own WhatsApp, you should be prepared to face strong competition. Let's consider best instant messaging apps for Android and iOS - the most significant players in the app market (besides WhatsApp, which we’ve already talked about in detail). Facebook messenger is one of the best instant messaging apps for PC and mobile phones. Since launch in 2011, it has gained popularity, comparable to the demand for WhatsApp. Its clean, light app interface is practical and user-friendly. BTW! As you remember, in 2014 the media giant Facebook acquired the WhatsApp messenger for an incredible $ 19 billion and clearly didn’t regret it. Of course! 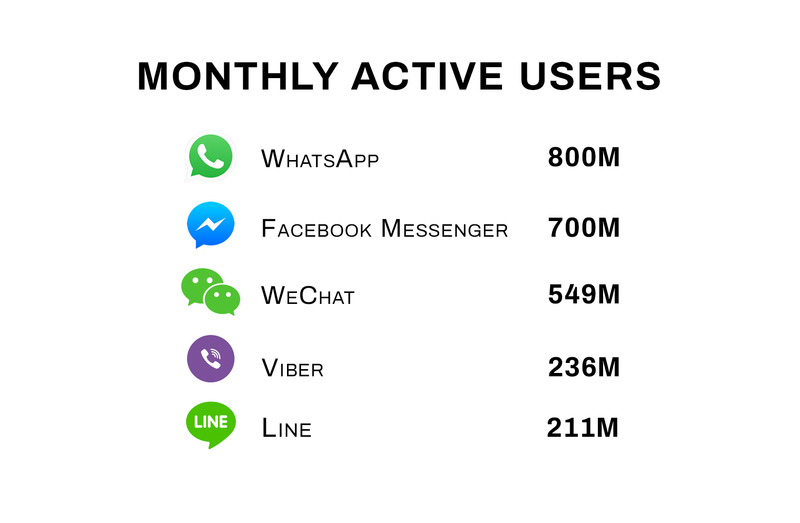 The number of active WhatsApp users has long exceeded a billion (1.3 billion in July 2017). Facebook and WhatsApp are similar, but both remain popular. So, you can also figure out how to create a messenger app which will be in demand. You just need to find the right approach. Programs providing a corporate communication platform are becoming more popular. Since Slack was released in 2013, it has already become one of the most popular corporate messengers. In February 2017, the number of its active users reached 5 million. SnapChat is another great instance of the best instant messaging apps for Android and iOS platforms. American teenagers call SnapChat one of the most important applications of their generation. Almost a third of SnapChat users are people from 18 to 24 years old. In a few words, Snapchat allows you to share the photo and video messages, moreover, the lifetime of such a message is set by the sender himself. So, you decided to find out what a WhatsApp app is and how to build it. But you also want to understand how to make an instant messaging app financially successful, right? Okay, let’s analyze the WhatsApp monetization strategy. Jan Koum and Brian Acton ignored the usual stereotypes. Instead of tracking the right audience through advertising, they decided to take one dollar for a product which doesn’t collect information about the user. And such an approach proved to be incredibly effective. Despite the rejection of traditional marketing, the company experienced impressive viral growth. This is because the product has fully met the requirements of the market. Until January 18, 2016, one should have paid $ 0.99 per year, starting from the second year, for using the app. As for Apple platforms, users had to make one payment when buying an application. Now the system is absolutely free. Subscription seems to be quite a good way to make a profit, agree? But to make use of it, you need to create a messenger app which will be in high demand, people should be willing to pay for your service. WhatsApp has allowed companies to send messages to users. Let’s say, the airline can notify the passenger about the cancellation of the flight. The instant messaging app wants to find out whether people are able to communicate with business representatives without spam and banner ads. The messenger has transferred data about its users to Facebook while remaining a separate service. Facebook will use phone numbers to fine-tune the advertisement. Besides, phone numbers in WhatsApp have been combined with Facebook users profiles. Insiders claim that WhatsApp plans to charge companies like Uber for the chance to send messages to users (with their consent, of course). But you’re unlikely to own a network similar to Facebook, so you need to consider more traditional ways of earning (if you want to build a WhatsApp clone with similar profitability). Paid subscription. As we’ve told, WhatsApp began its journey, charging a symbolic fee for using its services. And if such a monstrous competitor had been taking advantage of such a method of monetization, you can also choose it, at least, initially. Paid stickers and games. Many Asian messengers (like Line) are focused on paid stickers and games. It’s the way they’re getting profit. You can also come up with something of the sort when building a modern chat app. Extended functionality. Viber doesnэt charge a fee for using the basic functionality but you have to pay if you want to get additional possibilities. Say, you can make paid calls (Viber Out) and express emotions with paid stickers. If you want to succeed, you should satisfy the needs of the target audience, giving users a clear interface and advanced functionality. Let's saturate ourselves in the subject. So, what should you offer your users if you want to create a chat app like WhatsApp? First of all, you should provide users with the most convenient way to register. You can follow the example of other chat applications which take advantage of the phone number for the purpose in question. If you want to improve the security of your instant messenger, send SMS with a confirmation code. After all, we want to know how to make an app like WhatsApp, and Whatsapp acts this very way. The security step can be implemented through a third-party service, so-called API (contact us, if you want to know all the details, we'd be happy to assist). An empty chat is a sorry sight. Therefore, in order to avoid your users’ disappointment, allow them to integrate their phone and (if desired) Social Media contacts. However, if you're provided with a limited budget, don't go beyond the address book. It's quite enough for launching the MVP model. In the future, you’ll be able to add new features to build a real WhatsApp clone. History of conversations. Of course, it's very important to store the chat history and provide access to it from different devices (and a user must have a possibility to delete it if he wants) - that’s way Viber has chosen. Think about making the entire process as effective as possible. For example, take a look at WhatsApp which prefers not to use its server to store conversations. Chats formats. To create a messenger app of high competitive ability, you need to offer users different communication formats, namely private, group, and public chats. Additional Chat Features. Gladden your users with extra opportunities aimed to enliven their virtual communication. There are heaps of ideas of such pleasant trifles: congratulatory stickers (or just new and bright ones), custom fonts, preliminary scheduling messages (in honor of anniversaries or something of the sort) and so on. It all depends on your imagination and the approved budget. improve encryption technologies in order to secure users' communication. Modern people are used to sharing their impressions during chat sessions. And sometimes these impressions take the form of pictures, videos, animated GIF images, spectacular stickers and other things of the same kind. So, you need to offer a feature of multimedia file transmission - it’s the only way to create your own WhatsApp. And don’t forget about synchronization with different cloud servers (Google Drive, for example). Be sure to allow your users to share their location. Today, it'd be pointless to try to develop an app like Whatsapp without such a helpful feature, while your competitors, of course, have thought about it in advance. We’re sure your developers will find the best way to implement it (they may use special tools provided by Apple MapKit and Google Location SDK). Push notifications are another important feature rising the chances to build a WhatsApp clone. Notifications help keep users up to date, informing them of the latest news, messages they’ve recently received, and so on. You can take advantage of Google Cloud Messaging and Apple Push Notifications services to implement the notification system. VoIP calls. It’s quite a high-priced feature, but the instant messaging app which offers it will be perceived by users as a very advanced one. Its goal is to provide a possibility of making low cost (or even free) phone calls through the Internet. Thanks to VoIP calls, Viber and Skype have significantly expanded their target audience. Video chats. Well, this is another "must-have" feature, and users will highly appreciate you for providing it. Audio and Video streaming. Such a newfangled feature is very popular among users right now. Why not offer it to them? Analytics of applications. The next feature needed to create a messaging app like WhatsApp will help you analyze user behavior and build a more effective development strategy based on the data received. How to build an app like WhatsApp? Tips and tricks. take advantage of online services, APIs, libraries, protocols, etc. Actually, there are only a few options: you either undertake this task yourself or hire professionals. We don't recommend you to economize on expert assistance. Ultimately, you'll have lost a lot of time and energy trying to implement the chat idea by your means. And in the end, your time and energy are equivalent to money. What is more, no one can guarantee that the instant messenger you've made is competitive. On the other hand, experienced developers know how to create a messenger app - and a successful one. It would be judicious to create a chat app which works on all types of devices: iOS, Android, Windows, etc. It’ll allow you to expand the target audience and increase future profits. So be sure to order the instant messaging app development with this factor in mind (remember WhatsApp experience?). 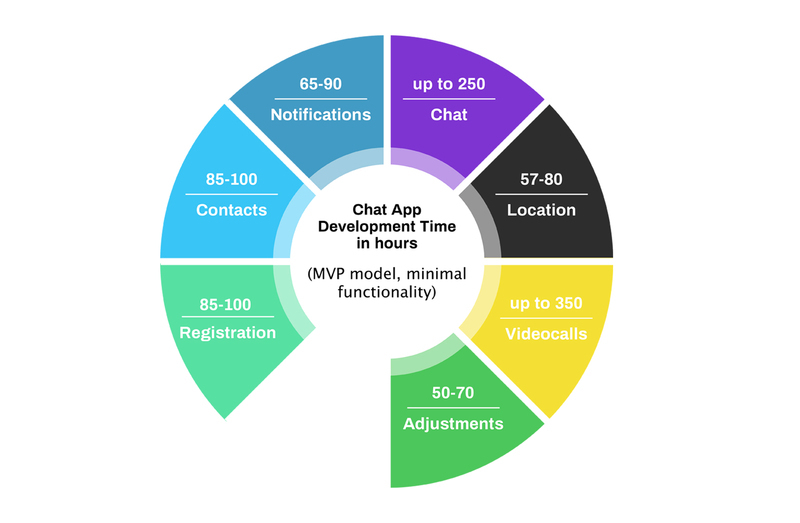 Previously, we’ve described in detail what features chat applications should have. If you do not have a huge budget and are looking for ways to save money, we advise you to start with minimal functionality and learn the user's reaction. In the future, it’ll be possible to supplement your instant messaging app with new possibilities interesting to a user. It’s a really crucial moment because we perceive the world visually and are responsive to everything that seems appealing to us. So if you really want to understand how to make an app like WhatsApp, be ready to study the latest trends in UX/UI design. To succeed, you should be modern. The main rule of the effective interface is usability and ergonomics. Make sure there is no need to make extra clicks to get the desired result (say, when writing a message or starting a video call). Therefore, the app design should be clean, laconic, aesthetic - and, of course, user-friendly. If you’re not sure about your abilities, find a professional UI/UX designer. Read in our article how to find a competent expert and not overpay while doing so. the server is needed just for the authentication. Messages are being encrypted and sent by using "client to client" method. If you’re in doubt which option is best to choose, check with your developers. The approximate period of work execution depends on the level of the project complexity and can reach even 2500 hours. 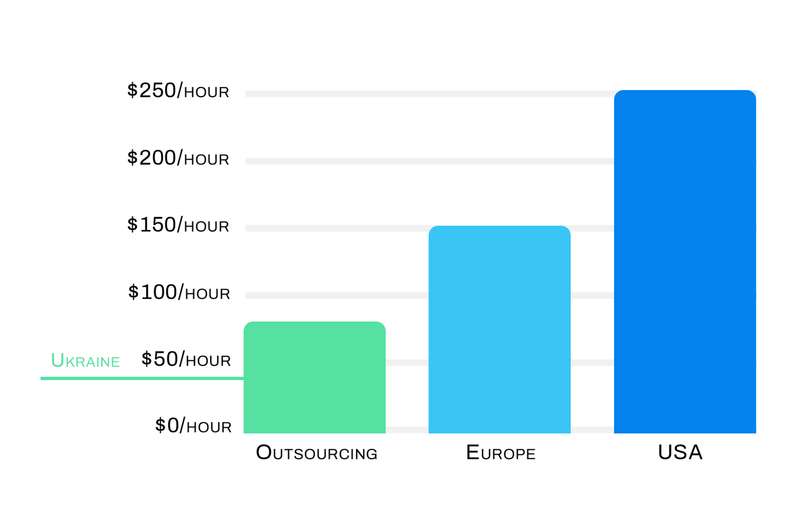 And if you have a lean budget, we recommend that you hire developers with affordable rates. We offer our services! Agilie experts have huge experience in the web and mobile development, and our rates are quite reasonable. We’ll create a messenger app which meets the users' needs in effective communication and brings you a stable profit.